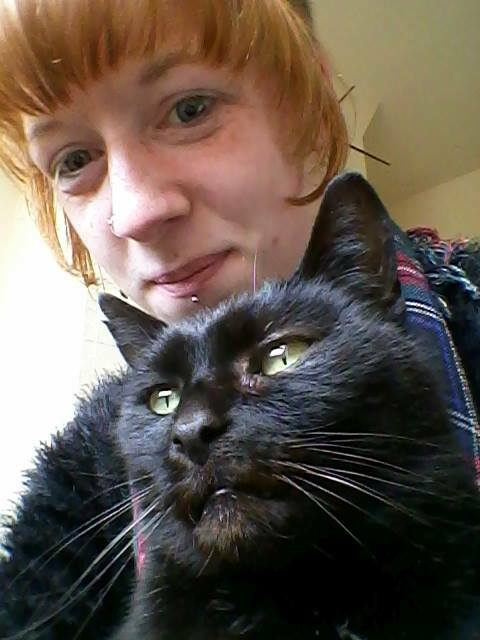 Sarah Green is a community-based arts practitioner working in collaboration with local arts organisation, Charnwood Arts. She holds a BA in Fine Art and MA Art in the Public Sphere from Loughborough University. In 2015 Sarah was awarded a fully funded research studentship from The School of the Arts, English and Drama at Loughborough University. Her current research explores the therapeutic use of textile craft processes and its potential to improve men’s wellbeing. 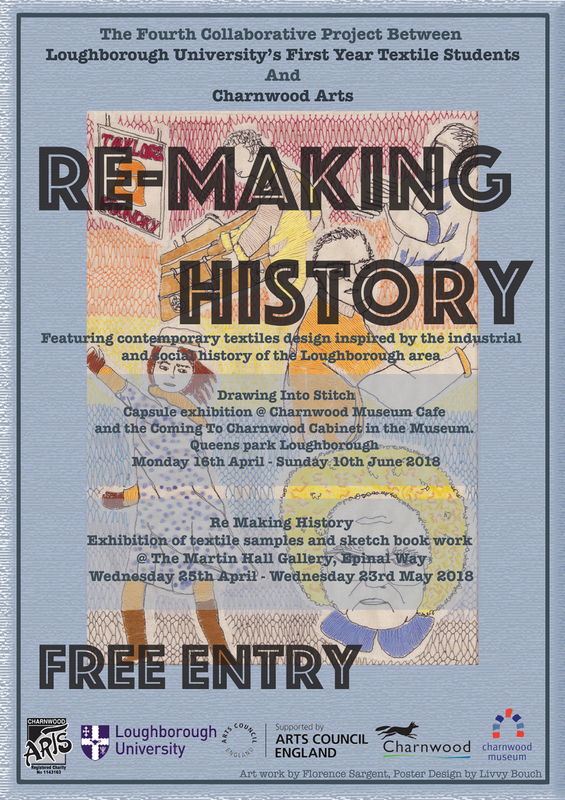 As part of her research she has established ManCraft, an all-male community-based textile craft group, which takes place once a week at Charnwood Arts. This blog brings together all the artists work including her PhD research, her work in the community and her extra-curricular work on other projects. 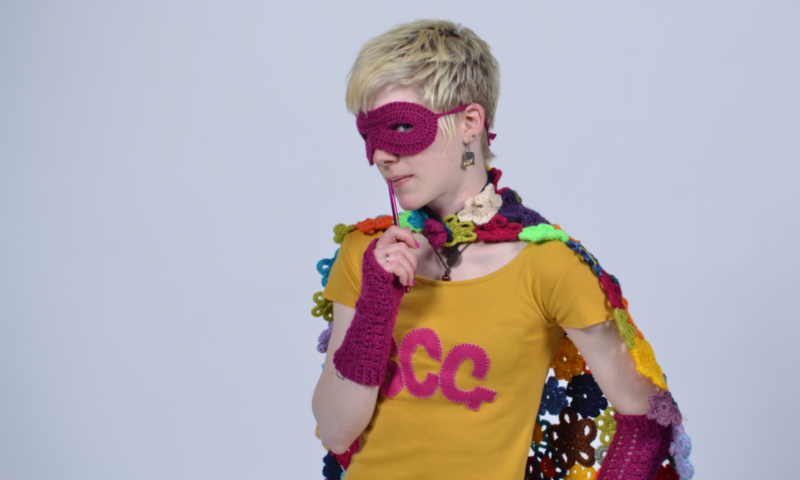 Sarah Green is the artist behind Super Crochet Girls creation. The alter ego was developed as part of her MA, which was concerned with exploring the effectiveness of craft as a political and activist tool. 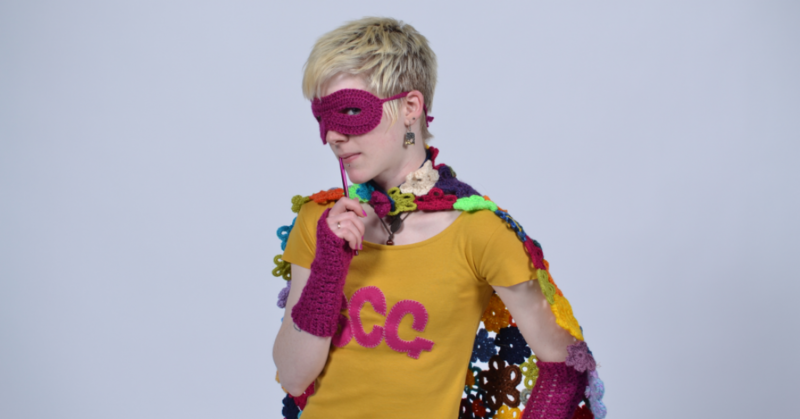 Super Crochet Girl was designed using materials and skills not often associated with super heroes, such as yarn and crochet. Designed originally for a poster exploring the relationship between comic books and public sphere theory. The persona later developed into a performative means of exploring the effectiveness of textile crafts use for activist purposes. Not content with leaving artworks in the public realm to instigate discourse, the artist instead drew inspiration from other artists such as Lisa Anne Auerbach, who designs, knits and then wears ‘protest’ jumpers and other apparel, adorned with text that makes political comment. ‘The traditional role of a Super Hero is to protect and serve the citizens and Super Crochet Girl proudly follows this tradition. But she does it through knitting, crochet and impromptu dialogue’ (Syston Town News 2014). As the character amalgamated two gender stereotyped hobbies, crochet and comic books, dialogue with the public tended to revolve around this aspect, ultimately questioning the traditional role of the superhero and how quiet past times, such as crochet, could be seen as a super power. ManCraft is a community-based textile craft group for men. Established by artist Sarah Green as part of her practice-based PhD at Loughborough University. In 2010 Sarah graduated from Loughborough University with a BA (Hons) in Fine Art. Following on from her undergraduate interest in participatory art Sarah completed MA Art in the Public Sphere, also at Loughborough University. Her MA research focused on the use of textile craft practices for activist action, termed Craftivism. She became increasingly interested in the community building aspects of textile crafting and sought the opportunity to gain experience as a community-based practitioner with Charnwood Arts, a local arts organisation based in Loughborough. After graduating from the MA Sarah continued her collaborative work with Charnwood Arts as project co-ordinator for ‘Our Knitted Story’, a year-long project which involved working with a number of community groups across Leicestershire and invited contribution from 1st year textile students from Loughborough University. Sarah also acted as a regional partner for the Craftivist Garden #wellMAKING project in 2014, a collaboration between Falmouth University, The Craftivist Collective, Voluntary Arts and Arts for Health Cornwall, which aimed to raise awareness of wellbeing through sewing, http://projects.falmouth.ac.uk/craftivistgarden/category/charnwood-arts/. In 2015 Sarah was awarded a fully funded research studentship from The School of the Arts, English and Drama at Loughborough University. ManCraft: the therapeutic use of textile craft processes for vulnerable men. How can the therapeutic use of textile craft processes help achieve wellbeing for vulnerable men? Sarah’s practice-based PhD research aims to establish whether textile crafts have the potential to provide men with a therapeutic tool that they can use to help prevent or reduce the risk of deteriorating wellbeing. The male suicide rate in the UK in 2013 was three times higher than in women and remains the most common cause of death in men aged between 45-59 (Office for National Statistics 2016). This is often related to men’s reluctance to seek help combined with the notion that men present different symptoms of mental health illness than women (Spendelow 2015, Mental Health Foundation 2016). Counter to this we have several significant empirical studies providing evidence of the therapeutic benefits of textile craft processes to health and wellbeing (Riley et al 2013, Reynolds 2004, Corkhill 2014, and Dickie 2010). However, these studies focus primarily on women, leaving men at continued risk from poor mental wellbeing. Mental wellbeing here referring to a generalised notion of mental health as experienced by everyone. Through the use of community-based practice, in the form of an all-male textile craft group called ManCraft based at Charnwood Arts, Sarah aims to extend our understanding of the value of textile making in relation to mental wellbeing and to increase knowledge and understanding of the role of the arts worker within community-based art practices.